To determine which programming is appropriate for your child, check out QuickStart Pathway Pointer here. Check out 8UTA's website! Lots of great programming for kids 3 to 8. ACAC Charlottesville website, click here. ACP&R website, click here. Lots of new programming!!! Matilda Blue website, click here. Matilda Blue on Facebook, click here. Matilda Blue programs are also offered at Charlottesville Catholic School, Crozet ES, Greenbrier ES, Red Hill ES, Mountaintop Montessori School, Peabody School, Ivy Creek School and Carver Recreation Center. PROGRAMMING -- Charlottesville Parks & Recreation website, click here. Then click on On-Line Registration and then Athletics under Activity Type. QuickStart programming schedule will appear. Programs are being taught by Matilda Blue Tennis. Sessions at Pen and Tonsler Parks and the newly renovated Carver Recreation Center. On-line enrollment is available!!! SuperStarters Sports -- Program sites: Baker-Butler ES, Broadus Wood ES, Brownsville ES, Burnley-Moran ES, Cale ES, Greer ES, Johnson ES, Stone-Robinson ES, Stony Point ES, Woodbrook ES and Yancey ES, Claudius Crozet Park, Darden Towe Park and Western Albemarle High School courts. For more information, click here. Claudius Crozet Park, programming on the three 36-foot QuickStart Tennis courts. For more information, click here. Fluvanna Parks & Recreation at Carysbrook Recreation Center. PROGRAMMING -- Fluvanna Parks & Recreation programs, click here. Programs are being taught by Alina Ackenbom of Friendship Tennis Academy in Palmyra. 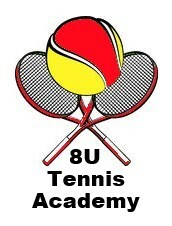 For more information about VTA (Virginia Tennis Association), go to their website. For information about tennis activities for all ages, visit the Charlottesville Tennis website -- a public service to our community since 1998 and the best tennis resource in town! Keep a Kid on the QuickStart Pathway!